Protect freeze-sensitive above-ground backflow protection devices with these rugged insulated enclosures. Drain openings in enclosure base accommodate maximum RPZ discharge for valve sizes indicated. 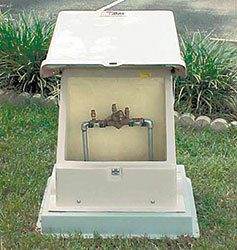 Drain ports are protected from wind‚ debris and animals with screen wire and flap. Heated models maintain 40°F temperature even when outside temperatures fall to -30°F and with winds up to 15 mph. Enclosures feature flanged bases that can be anchored to a 4" thick concrete pad. For quicker and easier installation‚ use one of the optional prefabricated fiberglass mounting bases. They extend 2" above grade and 2" below grade and are anchored in place with backfill that covers a continuous lip extending from the bottom of the base. All bases include hardware that secures the base to the BFP piping. Custom enclosure options include: enclosures for up to 10" pipe size‚ custom colors‚ decorative rock or smooth fiberglass designs. Contact USABlueBook for details.